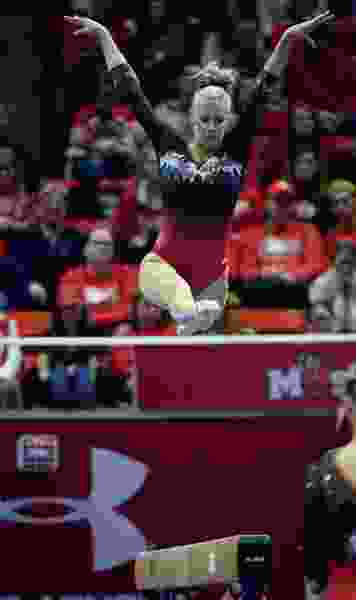 (Francisco Kjolseth | The Salt Lake Tribune) Makenna Merrell-Giles performs on the balance beam as Utah hosts Penn State in their season opener at the Huntsman Center in Salt Lake City on Saturday, Jan. 5, 2019. Utah’s third-ranked gymnastics team handily beat No. 23 Arizona 197.075-195.4 Friday in the Huntsman Center, but enthusiasm over the win was tempered some by a notable absence in the floor lineup. Utah junior MyKayla Skinner, who won the NCAA floor title in 2017, sat out of the floor exercise due to a sore ankle. The Utes contemplated keeping her out of the event a week ago when they competed at Arizona State but she talked her way into the lineup and scored a 9.85. There were no negotiations with Utah’s coaches this week. Normally having a gymnast rest due to soreness isn’t a big deal, but this is Skinner we are speaking of, the standout who has yet to fall in a college meet and is the NCAA all-around runner-up the last two years. Skinner is tied for eight on the floor with a 9.912 average this year. The Utes aren’t sure how long she could be sidelined, but both Skinner and the coaches are downplaying the situation. “She competed on it at Arizona State but we wanted to let it calm down,” Utah coach Tom Farden said. Skinner said the ankle was feeling better but was glad to rest it. “Hopefully we can start tumbling again next week,” she said. Utah’s MaKenna Merrell-Giles won the all-around with a 39.5. Her 9.925 on the floor in the anchor spot gave the Utes enough for a 49.525 floor score, a mark the Utes knew they needed to keep their streak of hitting 197 or higher in every meet this year. The tactic worked with freshman Adrienne Randall winning the event with a 9.95, Sydney Soloski scoring a 9.9 and Macey Roberts and Lee both earning 9.85. The Utes were pressed to get the big floor score after a subpar effort on the balance beam. Leadoff Alexia Burch fell and scored just 9.075. Shannon McNatt had a small break in her routine and scored only 9.6 as the second up. The Utes tightened up after that, with Lee scoring a season-high 9.925 and Merrell-Giles and Randall both earning 9.825. Skinner, who has yet to fall in her college career, had a big bobble but saved the routine and her streak of 129 made routines to score 9.75. “We were pressing a little too hard on beam,” Lee admitted. Farden said he was frustrated with the beam performance because the Utes have had at least one break in every meet, but they aren’t making those mistakes in practice. Farden said the Utes would focus on the beam in the coming week as they get ready to face Cal. “They are talented on beam; they are just trying a little too hard,” he said of the Utes. Key moment: Senior Kari Lee delivered a big beam score when the Utes needed it most, earning a season high 9.925. Key stat: The Utes scored a 49.525 on floor to break the 197 mark to keep their streak alive.